So the TR7/8 love-in that was Retro Cars is no more... a shame but with the difficult media market it is hard for all of the classic car titles to survive. The stablemate of Retro Cars 'Classics Monthly' moved into Retro Cars territory last year so the end of the title was not too much of a shock to some of us. "How good is it? Imagine a 25 year old TVR that starts on frozen mornings and doesn't break down.... Well sorted TR8's, original or otherwise, are a blast. Try one." 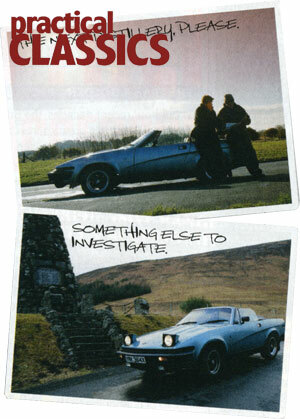 Further on in the magazine there's Part 8 of the GT6 restoration and a small 'postcard' feature of a Triumph Stag, and a good comparisson review of some 1980's turbos - including the Audi Quattro which was a fave of mine at the time. 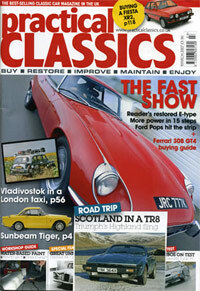 Also in March 'Classic and Sports Car' took a look at the entire Triumph TR range. A 'must have' feature for any TR fan - even if there's nothing new in this article it is an interesting read and the first time I've seen such a review of the entire TR line in a single article. There's also a look at some of the various prototypes or off-shoots that sprung forth from the TR loins. Plus there's a very condensed look at the competition history of the Triumph TR family. 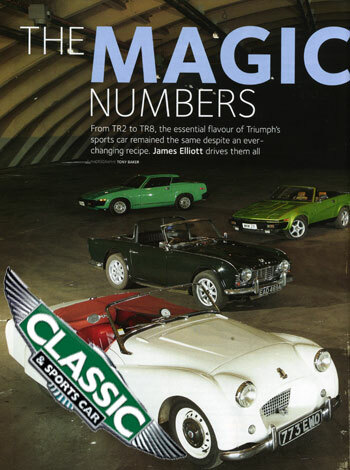 The author - James Elliot - drives the entire range, from the TR2 thru both the TR4 and TR4IRS up to a green TR7 and errr a green TR8 (genuine - not a TR7v8). It's fairly evident that James is not the biggest wedge fan out there - though he praises the driving layout and does concede that "is not half as bad as you've been lead to believe" a back handed complement if ever there was one. When it comes to the TR8 I get the feeling that James was expecting so much more than he got, and he was ultimately left a little disappointed.... he doesn't even mention the striking Triton Green livery which is (in my book) the best colour on a DHC. And then we're back to Practical Classis where, like Classic & Sports Car, there's multiple TRs on show - well two of them anyway. The feature pits Father against Son in comparing 4 recent classics against one of its fore-fathers from a previous era. 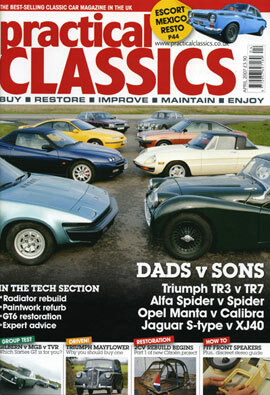 Also included is a look at the Alfa Spider - comparing a 3.2l v6 from 2002 against the iconic Spider from 1971... I'm partial to Alfa's and was close to getting a 2000yr v6 model (but opted for a Jap import FTO instead!). As for the TR test there's a definite favouring of the TR3 from author Dr. Allchorne - who finds the wedge quite appealing. Picking through the words it is clear that the TR3 gave the Dr more of a thrill, with the TR7 impressing with the ride comfort rather than the driving experience. Perhaps a little surprisingly the main wedge-gripe comes with the 'flimsiness' of the TR7 and the mainrenance aspect needed to keep one running sweetly. In his own words the TR3 'feels unburstable' by comparisson. I should also say that PC has a 'Your Cars' feature - you just need to e-mail them a few words and a few good quality (300dpi) pictures of your car. You can contact use through this e-mail address - if you are aware of any recent or upcoming features. If you wish, you can read the press round-ups from August 2006 or April 2006 to see what you may have missed in the past.